NOTE FROM JOE: I believe EVERY person can accomplish far more than they ever thought possible with their personal finances. You CAN win with your money! 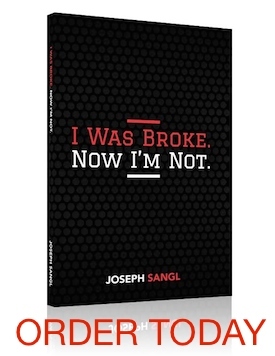 The more I teach personal finances, the more I am convinced that “remaining broke” is a choice. It is true that we can’t change our upbringing or our family. We also can’t change where we start financially. However, ALL of us can affect our financial future. Now many people will tell you a very convincing story of why this is just not true for them. Their story will be so compelling you will almost believe it yourself. “My spouse won’t participate in our family finances.” This is certainly a dreadful scenario, but it can AB-SO-LUTE-LY be overcome. I would spend every dollar necessary for the coaching and counseling necessary to help resolve the issues behind this! A huge motivator is the fact that while marriage is grand, divorce is at least a hundred grand! If we’re willing to spend tons of money to split a marriage up, we ought to be willing to spend the same to save it! “I am intimidated when it comes to money.” There is a lot of truth in this statement! Learning about investing, insurance, and focusing on becoming a better money manager is challenging. Remaining BROKE, however, is much more challenging, so make the choice to overcome the intimidation and learn little-by-little. Over time (shorter than you think), you will become a GREAT money manager! I stopped being broke the day I decided to make a choice to win with money. If you are broke, make the decision TODAY to stop being broke. If you are not broke, stop and celebrate for a moment, and then share this post on Facebook and Twitter with those in your life who are struggling with this! Some people have low-wage jobs; something like one-fourth of jobs today pay less than $10 per hour. Add student loans and someone can be broke for an extended period of time. I agree! There are too many people out there that fail to take responsibility for their actions. As long is you have the motivation, you can make anything happen! There are 24 hours in the day and plenty of jobs waiting to be taken. That extra job may not be the job of your choice, but you sure will enjoy it when those paychecks go to savings! How do you get and keep an extra job when you don’t have a car? It takes me one hour to get to work now; I don’t know how I could get to Job #1 then get to Job #2, and back home the same day. Many menial jobs have varying schedules which make it difficult to keep multiple jobs at the same time. I was once scheduled to be at two jobs at the same time on a holiday, and had to choose which job to give up when I could not find someone else to trade shifts.